NEW YORK (CNNMoney) -- Apple on Monday announced plans for much of the $97.6 billion in cash it has accumulated from massive iPod, iPhone, iPad and Macintosh sales. The company said it would begin giving shareholders a quarterly dividend of $2.65 per share sometime its fiscal fourth quarter, which begins in July. Apple last offered a dividend in 1995. Stock repurchases generally help companies inflate their earnings per share because it reduces the number of shares outstanding. But profit growth has rarely been a problem for Apple, which routinely blows past Wall Street analysts' quarterly earnings forecasts. Apple said the share buybacks will help stave off earnings-per-share dilution from future employee stock grants and purchase programs. The company said it expects the dividend to cost the company $2.5 billion per quarter, making it one of the largest dividend payers in the United States. Combined with the repurchase program, Apple said it will likely utilize $45 billion of its domestic cash through 2015. It's significant that Apple is using its domestic cash, rather than the much heftier stockpiles it holds overseas, because foreign cash would be subject to a sizable "repatriation tax" if brought back into the United States. Cook said the company didn't want to pay that tax. 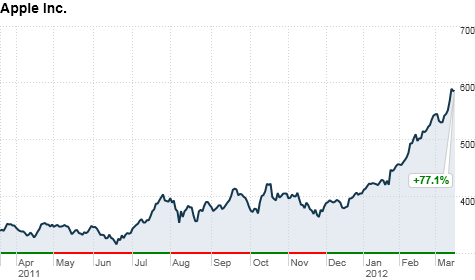 Shares of Apple rose just less than 3% to close at an all-time high of $601.10. Growth at Apple has not been a problem: The company is on pace to become the largest technology company in the world by revenue, and during the holiday season it posted the second-most profitable quarter by any corporation in U.S. history. Nevertheless, Apple is actively looking for new investors. Some fund managers have stopped buying shares as Apple's stock price has soared. But many funds require a dividend from the stocks they invest in, so they have had to stay away from Apple. "Investors have been wresting with the question of, 'Who is left to buy the stock?'" said Alex Gauna, tech analyst at JMP Securities. Cook said he hopes the dividend will open up Apple's stock to a new investor base. Apple's dividend yield -- the percentage of a company's share price that it pays out in annual dividends -- is currently 1.8%. That's higher than the dividend yields of other technology giants, such as IBM (IBM, Fortune 500), Cisco (CSCO, Fortune 500) and Oracle (ORCL, Fortune 500), but it's lower than the yields of more direct rivals like Microsoft (MSFT, Fortune 500) and Hewlett-Packard (HPQ, Fortune 500). Apple's dividend yield is nearly twice the average for the tech companies in the S&P 500, but a bit less than the 2.1% average for the overall S&P 500.